Coffee scales are unique tools to help you hone and perfect your coffee experience. You can use them to determine what the perfect amount of coffee is for a consistently amazing cup of coffee every time. We’ve gone through some of the most amazing scales on the market in order to present you with this coffee scale buying guide. But first, let’s learn a little more about coffee scales. Capacity: The capacity is how many pounds or grams of coffee the scale will measure. Some of these higher-end scales only measure up to a certain amount, while others go significantly higher. It’s simply up to you! Battery: For the most part, coffee scales run on batteries, so make sure that you know which type and can stock up on them. Some of them are even rechargeable, but that’s not typical for the most part. Digital Display: A digital display is easier to read than a needle-based one, so it’s definitely a neat feature to have available if you’re serious about making coffee the way that you want to make it. Stainless Steel: Stainless steel scales are always a nice idea in case coffee gets spilled on them or in the event that you use coffee makers that go directly on the scales. They will prevent rusting and are resistant to stains. Dimensions: The dimensions of the scale will tell you where it will best fit on your countertops. This allows you a much better idea of what you’re getting and how you’re going to fit it into your life. Backlit Display: The backlit display option will allow you to see the weight even in the dark or in low-light situations, such as your kitchen first thing in the morning. It’s a convenient feature that we know you’ll like. Now that you know everything there is to know about coffee scales, we can show you to coffee scale reviews. These are the best of the best, and you will definitely love them! Our top pick and the budget pick should be your first stop if you’ve just gotta get your coffee fix, but the rest of the list is worth pursuing as well, so make sure that you do that! Our pick for the best coffee scale, digital or not, is the Hario V60 Drip Scale. It can be used to measure both the quality and time of the extraction during brewing, which is a pretty amazing feature. These are two of the most important features of a good cup of coffee, so it’s great that it takes both of these features into account. The stainless steel top plate is easy to clean and rust resistant. That’s important because you can place the percolator directly onto the scale and measure exactly what’s happening to get the perfect cup of coffee. It measures in increments of 0.1 gram, so you’ll always get the most precise measurement of all of these factors, and we think that’s pretty amazing. Nothing is better in most cases than a perfect cup of coffee, and this coffee scale and get you on the fast track to perfecting your morning routine. We love it! Our budget pick is a scale that is not specifically for coffee. 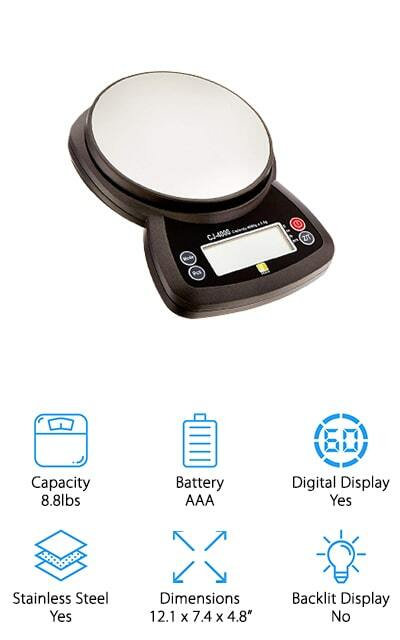 This kitchen scale can help you measure anything that you need to precisely add to your dishes, including all types of foods and spices. 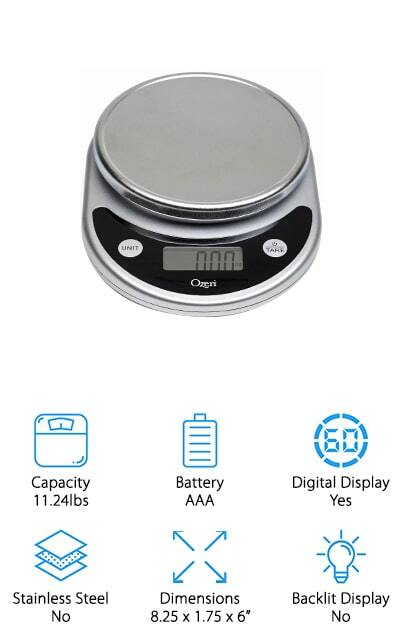 No matter how big or small the project is, this food scale can help you get the perfect measurements. You’re going to love how it helps you make coffee. While it isn’t as precise and perfect as some of the other models on our list, you can definitely count on this scale, and it will serve you well if you’d like to have a scale for more than just your morning coffee. 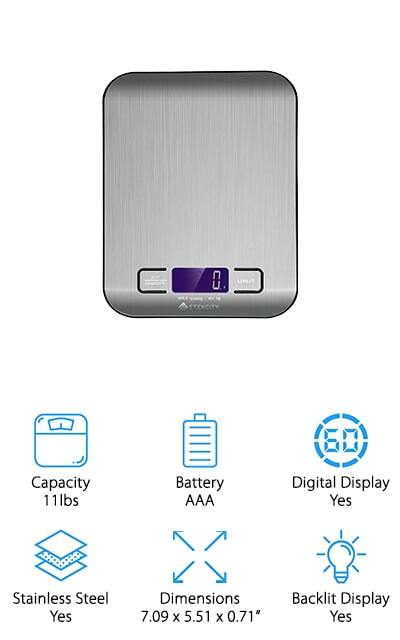 After two minutes of not being used, this scale turns off, which is a super useful feature that we’re sure you’ll love as much as we do. You can use it to weigh your mail as well, for when you aren’t sure how much postage to use! It’s a multifunction home scale! 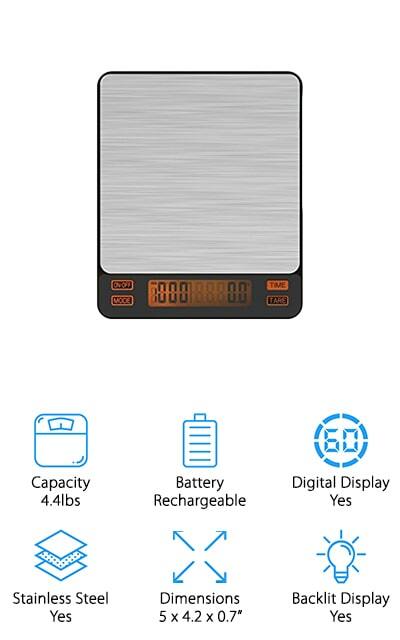 The Etekcity Digital Scale is the perfect precision kitchen scale. With a capacity up to 11 pounds, you can definitely make it useful for more than just measuring out your coffee. 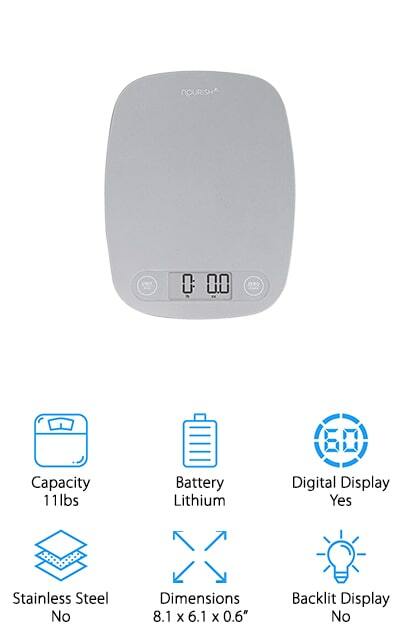 After two minutes of inactivity, the scale turns off, which is useful in a kitchen where you just get too busy to get to everything at once. It’s small enough to fit on even the most crowded of kitchen counters. You can hit the ‘tare’ button to get the scale on the weight back to zero, which is useful if you’re using it as a pour over coffee scale. That way the weight of your coffee is not influenced by the weight of the percolator or any other device. The display is a clear LCD that lights up with purple when you turn on the backlight, which is beautiful and unique! We love this petite, precise scale that will give you the accurate weight that you definitely need! The Brewista Smart Scale is perfectly created to be used only for coffee. One of the first features that caught our eye was the rechargeable battery function, which is super useful when you use it a lot. No reason to go through batteries like crazy when you don’t have to! The protective silicone pad helps to keep the scale itself from being affected by any spilled water during a pour, and from getting scratched up. They’re dedicated to bringing you a great-looking scale that will stay that way! It has a 4.4-pound weight capacity that helps to keep your coffee right in the optimal range. It also automatically tares and times your brew, and has six easy modes to help you get the most from your coffee. There are very few coffee scales with as many cool features as this one. It’s one of the best scales for coffee pour over that we found on our list! The Greater Goods kitchen scale is a great product for when you have more to measure than just coffee. It calibrates automatically and shuts itself down automatically, which we think is pretty amazing, all things considered. 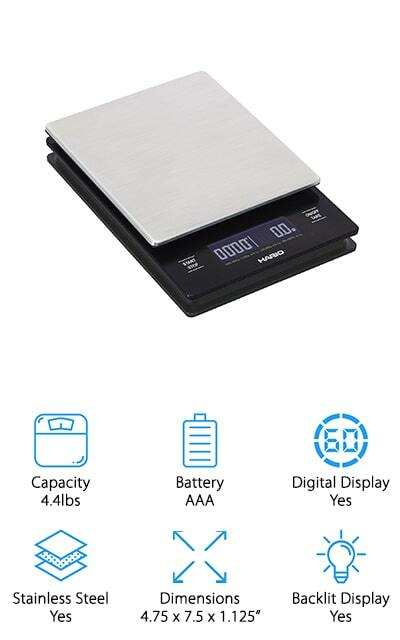 It’s an affordable scale that’s going to look great on your countertops with its nice dimensions and touch-sensitive buttons. The LCD screen is incredibly clear and wonderful, with a smooth plastic surface that you can clean really easily. It includes a guide and video to make sure that you’re getting the most out of this scale. It has a 1 gram resolution that will help you get the perfect measurement, and we love that. It’s good for measuring food portions as well as coffee, and it’s easy to read and fun to use. You can switch between the display being grams, pounds, ounces, fluid ounces, and milliliters if you need to! Its four sensors ensure that you’re getting an accurate measurement every time! ERAVSOW makes this perfectly-calibrated coffee scale that is dedicated to getting you the most flavorful and quality coffee from whatever type of bean you’re using. It has a high-precision G-sensor so that you get the most accurate measurements, as well as being able to measure in ounces, grams, fluid ounces, and milliliters. The huge display is easy to read and backlit for when you need it. It provides you with alerts for low battery and overload, and the platform is made of easy-to-clean stainless steel so that you won’t regret any messes. It has an auto-power-off feature that turns the entire system off after five minutes, which makes it convenient so you don’t have to worry about going through the shutdown process. It takes two AAA batteries, which are included on the scale. It’s a sleek design that works well and gives accurate measurements from 0.1oz up to 6.6 pounds. We think that’s a pretty amazing range! The HuiSmart digital coffee scale is great for getting that perfectly caffeinated cup of coffee in the morning. For everyone who enjoys their coffee perfectly portioned and amazing, this is a great scale for you! It can measure up to 6.6 pounds, and it’s easy to store and carry. 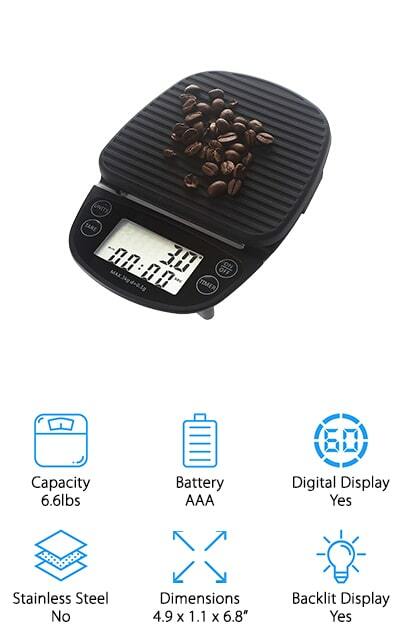 Being small and lightweight doesn’t mean that it’s not powerful, however; this sleekly-designed coffee scale with timer is just as powerful and accurate as many of the others on the market and on our list. IT’s easy to clean, which is always a plus, and has so many settings to make your life easier, including a backlit LCD display that’s easy to read and a low battery indicator so you know when to replace the AAA batteries. We love that it’s both compact and portable, so when you need to move it out of the way it’s easy to get it where you want it. That’s amazing! 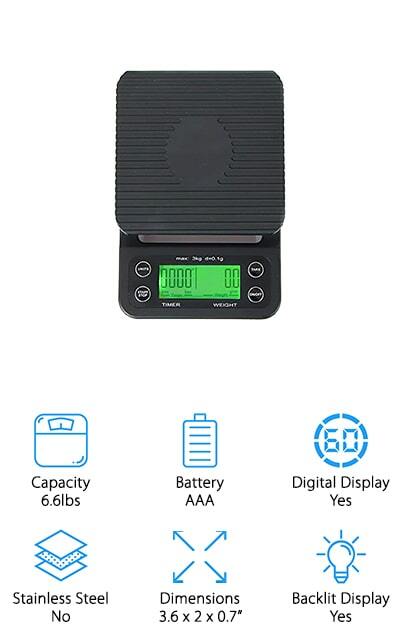 You can weigh up to 6.6 pounds on this precise scale, in increments of 0.05 ounces. That’s incredibly accurate! The high-quality precision sensors tell you exactly when the ideal weight has been reached and not a few moments after, so you’ll always get the most accurate measurement in real time. It’s great for portion control as well as pour-over coffee, postage, and jewelry weights. This coffee scale really does it all, and it’s all possible due to the advanced precision sensors that come preloaded into the scale. It’s super easy to operate, and will auto power off, give you a low battery timer, and it even has a tare function. You can even use this nifty scale as a cooking timer. The possibilities are endless and we love that! Of course, the pour over coffee function is the most important, but the fact that it can be used for many other things makes it incredible! The capacity of this beautiful and functional Jennings Compact Scale is 8.8lbs, so a little more than most other coffee scales but also big enough to do small kitchen measuring as well! It includes both the power adapter and batteries so that you can choose how portable you need it to be. The display is backlit and easy to see, with buttons that are easy to access and press. There are useful functions like counting, auto shut-off, and tare. This adds to the usefulness of the scale tenfold! It can measure out in increments of 0.5 grams, and you can also switch to pounds if that’s easier for you. We love that it also comes with a clear plastic cover to keep it safe when not in use and protect it from certain spills and damages. 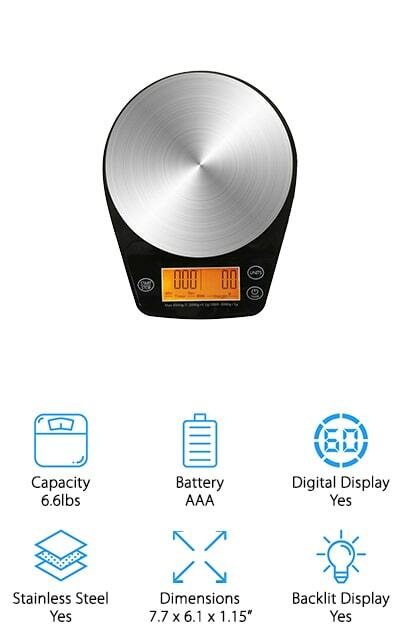 We absolutely love this scale with all of its functions and amazing modes! It will be sure to get your morning started off right! 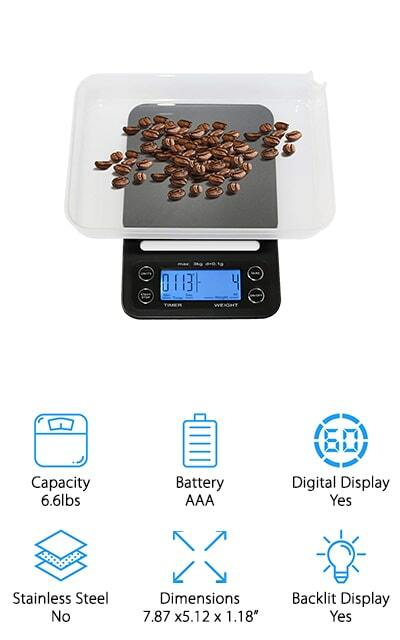 The DOANTE Coffee Scale has the normal coffee scale capacity of about 6.6 pounds, in increments of 0.1 grams. That’s super useful for when you have to get just the right measurement. The sensors are super sensitive and high precision so you always get just the right measurements no matter what. It has three different unit modes, including kilograms, grams, and ounces so that you can measure however you see fit. The anti-slip silicone cover is removable, and similar technology on the bottom makes it stable so that it won’t slip while you’re trying to measure things! We love it! The LCD display is backlit so that you can clearly see no matter what the lighting conditions are, and it even has a timer so you get the perfect brew each and every time. There’s a hole on the back of the scale so you can hang it on your wall, freeing up your counter space!